The new tools, the information, trades should be shared equally. Generally big industries vanished countries classes of society and peculiar individuality of the various nationalities. The workers in different countries are treated differently in the same big industries. The state can bring the organizations or industries but its not responsible for the purposes of Internal or external needs of employee. The illusion of law will provide the common necessities in a political or law form. Labor communities should be united without looking their classes of division through their material powers. There should be collective expression by all individual workers. 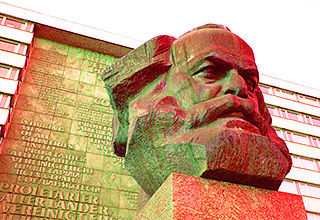 The German ideology was never published in Marx or Engels lifetime. When manuscript discovered in bad shape, Institute of Marxism in USSR published it as a book. Later chapters talking about religion telling that god and religion are imaginative. Man should create the history with his full consciousness. Talking about revolution it should not stand against the new technologies, innovations, discoveries, etc., It should against the differentiation, hypocritic ideas, exploiting the rights, non-sharing of profit, etc., An Individual should learn the new things in his field, should think critically, revolt against the odds, respecting the fellow human beings irrespective of his nature of work, self-consciousness, development, knowledge sharing and part of new society. - The German Ideology (End).